Map: Where Are Los Angeles' Car Break-In Hot Spots? Dr. Luca Zatraneau thought he had solid evidence to help police track down two men who stole his lab coat, ID badge and medical records from his car. They were caught in the act on security camera video entering the garage of his Los Angeles apartment. "I thought this is going to be a slam dunk," said Zatraneau. It wasn't, and Zatraneau's situation is far from unusual. An I-Team analysis of crime data found that 97 percent of break-ins in Los Angeles over the last five years remain unsolved. Wallets, wheels, third row seats. 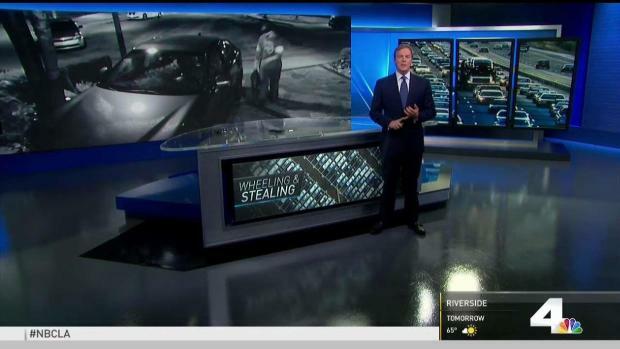 Car thieves are taking anything they can get their hands on, and now that includes the battery under your hood. NBC4 I-Team investigator Joel Grover reports for NBC4 News at 11 p.m. on Nov. 21, 2018. Even when there's clear video of the criminal, an arrest isn't a sure thing. "It's a challenge to identify the suspect from that video," said LAPD Capt. Don Graham. Some neighborhoods are clearly hot-spots for car burglaries. The hardest hit areas include Venice, Playa Vista, Larchmont and Mid Wilshire. But North Hollywood is the No. 1 area for car break-ins. You can use the map above to see how common break-ins are in your neighborhood and how many arrests have been reported. Use the search function to look up your neighborhood.